So as many of you know, fitness is an important part of my life. But many of you may not know that this hasn't always been the case. It all started back in September 2013. My boyfriend and I had just moved back to Nebraska from Arizona. Although I'd accepted a great job offer at my alma mater, I was unhappy with other aspects of my life -- most notably with my appearance. While I've been blessed with a pretty good metabolism and have never had to work super hard to maintain a slim frame, I began noticing changes in my body that set off a few warning signals. Some of my favorite clothes that I'd been wearing for years started to feel tight and look unflattering. I felt more lethargic than ever. I completely lacked energy and I was paying zero attention to my diet and my exercise regimen was non-existent. For the longest time, I'd joked about not being the gym-going type -- working out just wasn't my thing. It took me nearly 24 years to realize that I'd been self-sabotaging my health and well-being by having that type of attitude. When I first started working out, I was strictly doing cardio and some very mild weightlifting, mostly focusing on upper body (because what woman doesn't want super toned arms?). After sticking with it for more than two months, I was feeling great. I had more energy, and going to the gym began feeling less like a chore and more like something I wanted to do (crazy, huh?). But I wasn't really seeing any changes (why didn't I look like Serena Williams yet?) and, worse, I was starting to get pretty -- well -- bored. Just like that, I'd hit my first plateau. Plateauing is one of the hidden dangers of pursuing a fit lifestyle. You get into a good routine that makes you feel comfortable and confident; you've pushed yourself into previously unfamiliar territory and now it's all downhill from here, right? Once your body has mastered a routine, it wants more. It wants something new, different, exciting. Otherwise, it won't feel challenged and you won't see the results you seek. Fitness isn't about maintaining the same, boring status quo. It's about continually smashing through the status quo and surprising everyone (including yourself) with what you're capable of -- both physically and mentally. This anecdote illustrates why I began making variety an essential part of my fitness strategy. Today, I do everything and anything I can get my body to do -- cardio (using different machines is key! ), weightlifting (lower body lifts are a total body workout), yoga (such a great stress reliever plus an excellent way to improve flexibility), HITT workouts (Nike+ Training Club drills are awesome), and -- last but not least -- barre. 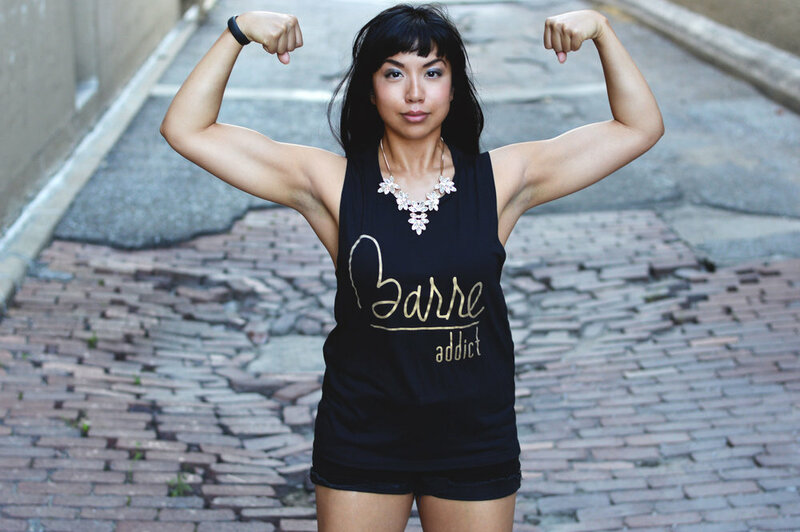 I love barre because although it's a low-impact workout, the way you target muscles is definitely not low-impact. The small, isometric movements may not look like much, but they pack a punch in terms of results. I always joke that after a barre class, I feel muscles in my body that I had no idea even existed. If you haven't tried a barre class yet, I highly suggest doing so. I've enjoyed my sessions at Pure Barre, but no matter where you take class, you're sure to have an awesome experience. And while the first class is always a little intimidating, it gets more addicting the more you go (trust me on this). 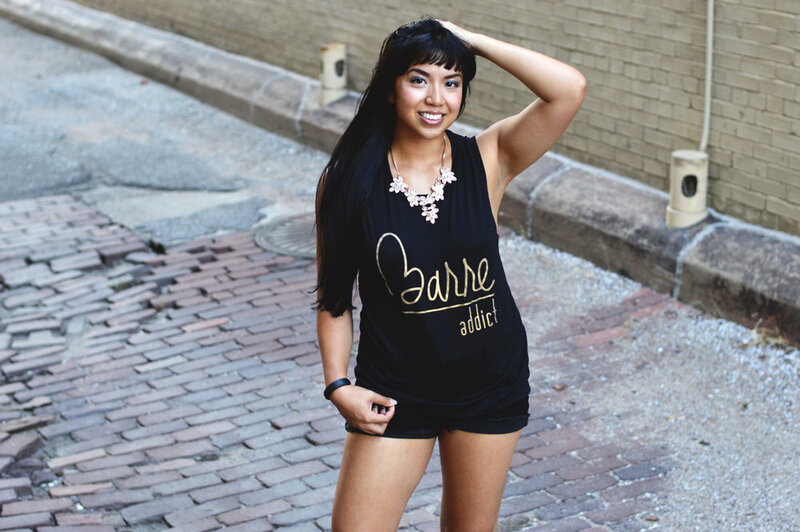 This tank top from E + J Barre Boutique is made for all of us barre addicts out there. 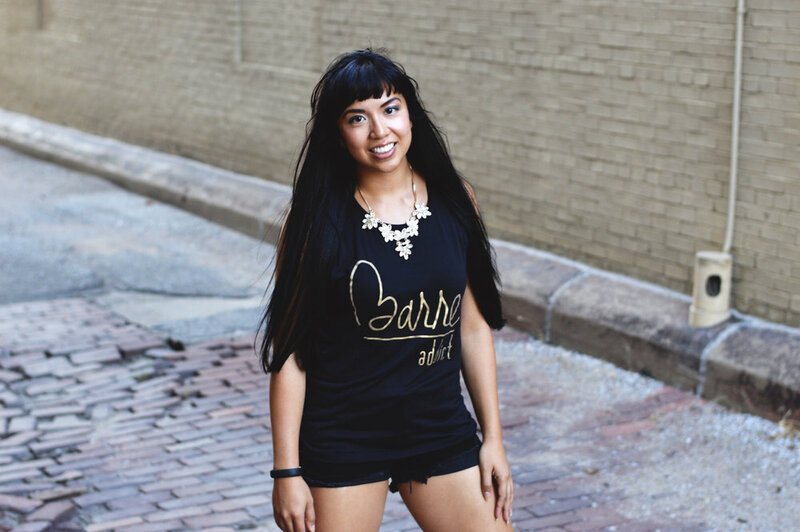 It's a black poly/viscose blend (meaning it's super comfy) that features the phrase "barre addict" in pretty gold script. Isn't it perfect?! 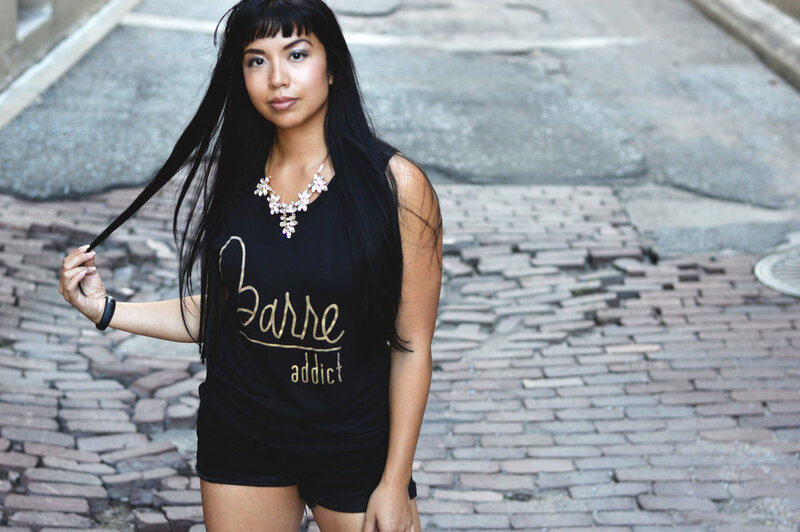 E + J Boutique has many other amazing tops that are ready to take you from the studio to the street in style (the "mind over matter" tank is one of my other faves)!